Geraniums will grow in a wide variety of soils, but making the effort to improve the soil to ideal conditions can make a big difference in the quality and number of flowers, and the health of the geranium plants. The roots are the key to a healthy plant. Healthy roots need healthy growing conditions. If your garden offers less than ideal growing conditions, consider soil supplementation for your particular problem. Geraniums will grow in almost any soil type as long as it is well-aerated and well-drained. Clay and heavy soils can be improved with sphagnum peat moss, leaf mold, organic compost or composted manure. Soils with poor drainage can be improved by creating a raised bed. Geraniums prefer a mildly acidic soil pH between 5.8 and 6.5, according to the Department of Horticultural Science at N.C. State University. Below 5.8, the plants are susceptible to problems with excess iron and manganese. Below pH 5.5, geraniums will develop brown spots on the leaves and may not flower. A soil test will determine the soil pH and give recommendations for improving the pH, if needed. Soil fertility is very important to the growth and flowering of geraniums. A lack of nitrogen will cause the growth to be stunted and the leaves to turn yellow. Too much nitrogen inhibits flowering. Commercial soil mixes will provide all the nutrition that potted geraniums need for two or three months. Fertility can be improved by adding organic materials or by using a good general fertilizer. A water-soluble, 20-20-20 dissolved in water at the rate of 1 tsp. fertilizer per gallon of water is sufficient. Outdoor plants benefit from the use of a slow-release formula. Geraniums require warm soil and should not be planted outside until the soil has warmed and the last frost date has passed. 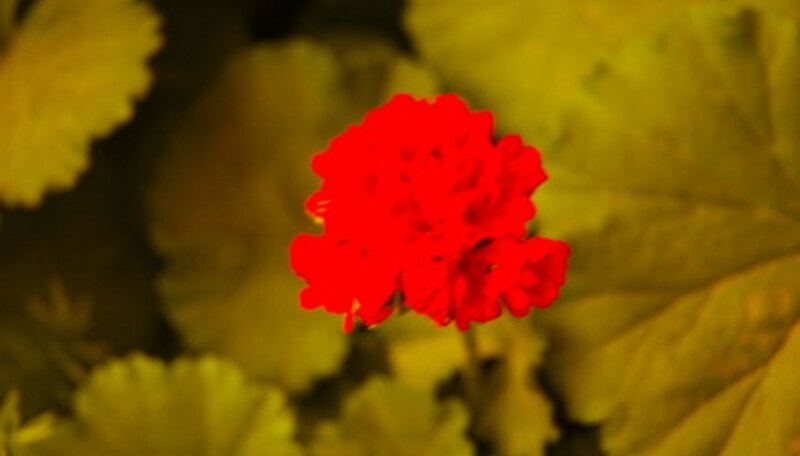 The ideal air temperature for geraniums is between 55 and 70 degrees Fahrenheit. Container-grown geraniums should have the luxury of a perfectly prepared soil. Use a ready-made soil mix from the garden supply store, or supplement the native soil. When using native soil, a well-aerated soil mix consisting of equal parts soil, peat and sand is best. For each cubic foot of soil mix, incorporate 3 oz. of super-phosphate, 4 oz. of dolomite and 2 oz. of a micro-nutrient mix. What Types of Soil Do Plants Grow Best In?